Gasparilla Arts Month in Tampa continues this weekend, March 11th & 12th, with the 2017 Gasparilla Music Festival at Curtis Hixon Waterfront Park in downtown Tampa. The festival is presented by the Gasparilla Music Foundation, a 501(c)-3 nonprofit corporation founded in 2011 by the “Ring of Fire” - a consortium of local community leaders, music professionals, and businesses who have the common goal of creating a signature music event in Tampa Bay. Part of the Foundation’s mission is to support and promote music education and provides scholarships and instruments to talented local students. Gasparilla Music Foundation (GMFF) will feature a wide variety of musical acts on several stages and tasty cuisine from the region’s best restaurants. There’s totally a food item for everyone - offerings range from vegetarian corn dogs to soft shell crab sandwiches to Japanese fried chicken. Beverage partners Cigar City Brewing and Tito’s Handmade Vodka to make sure no one goes home thirsty. There will also be a refreshing beer garden in the southeast corner of the venue. On Saturday morning in the Kiley Gardens area, you’ll be able to get your vinyasa on at Dubb Tenn Yoga with music by Badda Skat, and led by instructor Sarah Lesch, from 11am-12:30 pm. Both the Saturday and Sunday schedules will include the Kids Fest from noon until 2 pm, which features kid-friendly live music, dancing, face painting, and an instrument petting zoo. Kids 12 and under get in free to the Gasparilla Music Festival, and the adjacent Glazer Children's Museum will be open with free admission all day. 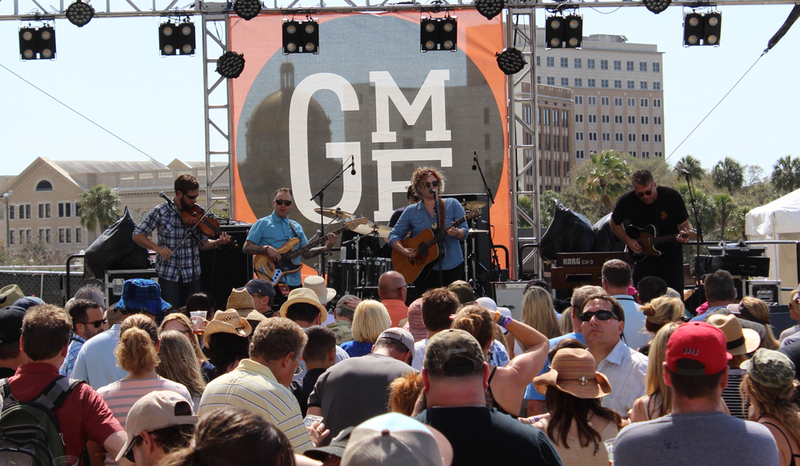 GMF will have four stages this year - the Channelside Bay Plaza Stage in the southwest corner, the Shea Barclay Stage at Tibbetts’ Corner, next to the beer garden, the Ferman Amphitheater Stage with a lovely view of University of Tampa, and in front of the beautiful, gently sloping grassy lawn, the main Sykes Stage. You can view a venue map and schedule by clicking over to the GMF website. Now let’s talk about the bands. I’m super excited to see Ghostface Killah on Saturday night at 8 pm at the Channelside Bay Plaza Stage. One of the original members of the Wu-Tang Clan, he released his first solo album Ironman in 1996. Like all Wu-Tang projects, it was produced by RZA, and debuted second on the US pop charts. Since then, Ghostface has released several albums with a variety of styles, including one inspired by the Italian slasher film genre known as giallo, 12 Reasons to Die. Saturday night at the main Sykes Stage is Cage the Elephant, a bass-heavy yet melodic band that formed in Bowling Green, Kentucky, but then moved to London before their first album was released. Known for energetic live performances, the band has a wide range of influences, from funk to punk rock to the Pixies. Their fourth album, Tell Me I’m Pretty, won Best Rock Album at the most recent Grammy Awards. Sunday is just as exciting, with Chronixx & the Zincfence Redemption on the main stage at 4:30 pm. Hailing from Jamaica, his first album Hooked on Chronixx excited music lovers around the world. Fusing rock, dancehall, and reggae, this band will definitely get the crowd moving & warmed up for the Sunday night headliner, Ryan Adams. Called “one of the few truly great roots-rock troubadours left” by Entertainment Weekly, his new album Prisoner is quite a departure. It’s getting hugely rave reviews and widely regarded as a breakup album (though Adams denied this). The great thing about Ryan Adams is the way he writes heartbreak - and makes it pleasant to listen to. He manages to take the best parts of rock and country and meld them together into something everyone can enjoy. Tickets range from $30-$75, and you can get them right on the GMF website. Don’t miss out on this exceptional chance to enjoy great food and great bands in beautiful downtown Tampa!